The Office of the Registrar at OSU hosts a FERPA training module and quiz that is required for employees and affiliates to gain access to student information systems and is highly recommended for any employee or affiliate who works with students. Individuals should participate in the training relevant to their designated role at OSU. If you are not an OSU employee, you can take this FERPA training. *Please note: if you are not an OSU employee, your results do not get sent to our office and, therefore, we do not note your FERPA training in any systems. You may show proof of your training to your department leadership. In order to gain access to student information systems, including Canvas sections in which you are not a student, you must have a formalized role with the University. OSU non-student employees (i.e., staff, professional faculty, teaching faculty, administration) can access the online FERPA training and quiz module through the MyOSU Portal, under the “Employee” tab. Once in the “Employee” tab, look for the section called “Employee Quick Links,” located on the right side of the screen. 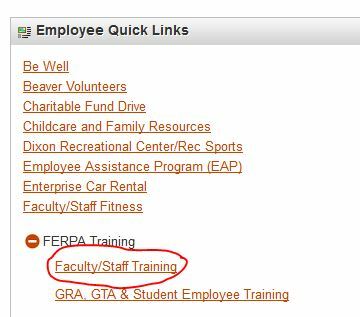 In that section, you should see a plus (+) sign next to “FERPA Training”—click that plus sign and then look for the “Faculty/Staff Training” link. Select that link. Please see the image below for visual instructions. Please note that the certificates produced by the old online FERPA training are no longer being accepted. If you need to provide evidence of FERPA training, you will need to take the training module hosted on the Portal. Once you have passed, you will be asked to submit your information, such as your name, OSU ID number, ONID email, department, and phone number. We will then designate in Banner that you have passed your FERPA training. If you do not have access to the Employee tab, you will want to contact Human Resources. Graduate Teaching Assistants (GTAs), Undergraduate Teaching Assistants (TAs), and student employees serving in a role wherein they will encounter student data should participate in the online FERPA training and quiz module. This module is housed on the MyOSU Portal, under the “Employee” tab. Once in the “Employee” tab, look for the section called “Employee Quick Links,” located on the right side of the screen. 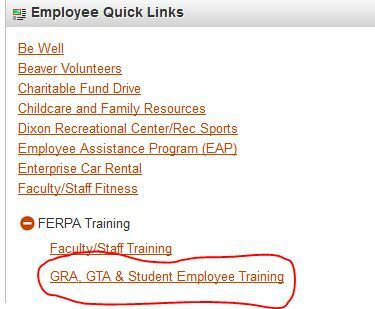 In that section, you should a plus (+) sign next to “FERPA Training”—click that plus sign and then look for the “GRA, GTA & Student Employee Training” link. Please see the image below for visual instructions. Please note that the certificates produced by the old online FERPA training are no longer being accepted. If you need to provide evidence of FERPA training, you will need to take the training module hosted on the Portal. Once you have passed, you will be asked to submit your information, such as your name, OSU ID number, ONID email, department, and phone number. We will then designate in Banner that you have passed your FERPA training. If you are a supervisor of student serving in a role that encounters student data and the student is not an employee of OSU, please contact the Office of the Registrar for assistance.